This is a general category used for various building projects. Now that the wings are done, I started work on the tail feathers. I wanted to give the plane more of a “vintage” look with a more rounded fin and rudder. I started by tracing the original outline from the plans. I then used my old flexible curve (an old drafting tool that you can bend to an arbitrary curve and it will hold its shape) to create a new outline. No science involved, just going by look. You can see the dotted line for the original and the darker line for the new shape. 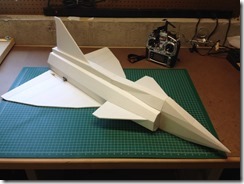 I then cut new pieces from 1/4″ x 4″ wide balsa sheet and assembled to the original kit supplied tail piece. I sanded a taper in the rudder from 1/4″ to 1/8″, like the original kit supplied part, but the rudder seems a bit too flexible to me now, so I may cut another and leave it un-tapered (or less tapered). 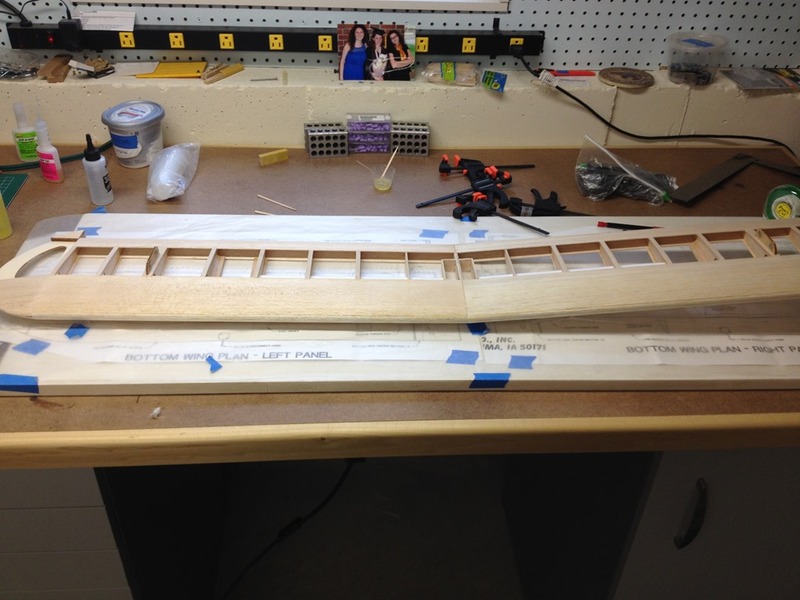 I also may cut some lightening holes in the rudder (and elevators), but will wait for a trial balance first. The stabilizer has been built according to the plans, but I will probably give the elevators a similar rounding off treatment to the rudder. I ended up with a slight bow to the stab after sheeting (about 1/16″ total). Not perfect, but not enough to worry about either. My motor arrived earlier this week too. I settled on a Cobra C-4130/14 instead of the C-4130/12. The “14” had a slightly lower Kv (450 vs 540) which will let me run slightly larger prop. Equipped with the motor mount, I marked and drilled the firewall. I also added a few holes for air flow (one directly behind the motor and set along the bottom). I glued up the fuselage doublers using Titebond weighted down with some paint cans to hold them flat while the glue cured (no pic). Unfortunately, there are no positive features in the design of the doublers to guarantee alignment. and one of the doublers slipped forward. 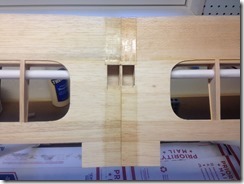 The notches in the doublers will set the firewall position, and if they are not perfectly aligend with each other, the firewall will not sit square. To compensate, I slightly widened the back of the notch to compensate for the slip, this will allow the firewall to sit square against the back of both notches and keep the fuselage sides in line with each other. If I were to build this kit again, I would drill a couple of 1/8″ holes and use a couple of dowels to pin the doublers before gluing. The dowels could then be cut flush and sand smooth and you would never know they were there. The cabane mounting blocks were next up. Thes must be positioned properly in order to ensure proper wing alignment and incidence. Here again, there is no positive alignment feature in the kit, so to ensure proper alignment, I used the following technique. 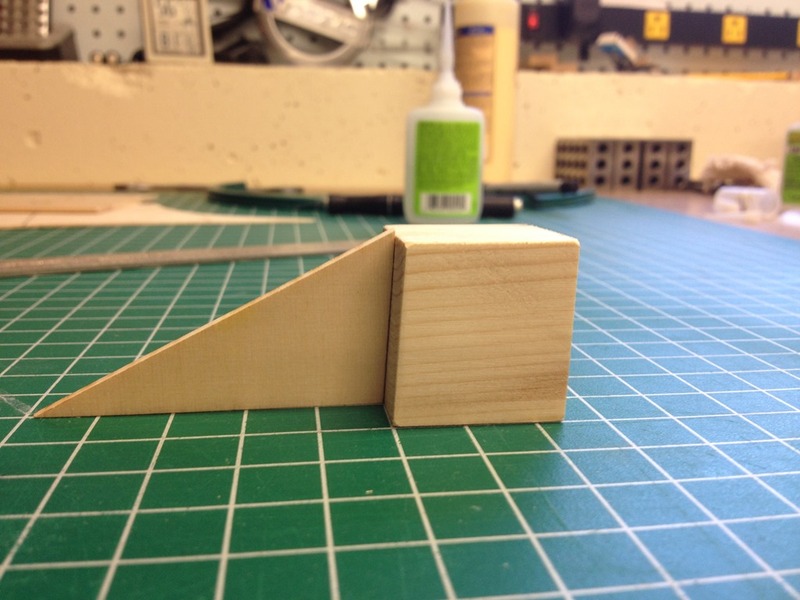 First, I drew a line marking the proper position for the top of the block (1/8″ below the top of the fuselage side. 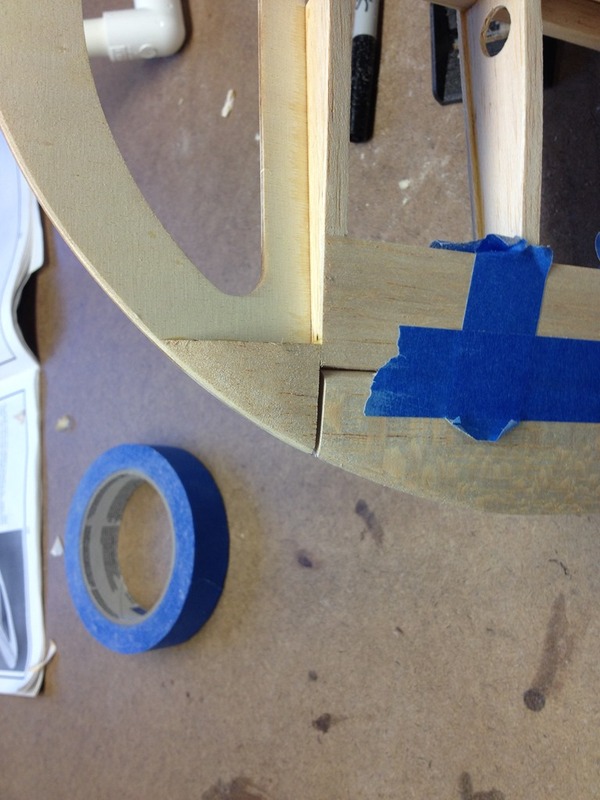 Next I cut a short piece of 1/8″ dowel, and inserted it into the laser cut hole in the fuselage side. I then slipped the aluminum cabane strut over the dowel (the dowel was cut so that it was flush with the cabane strut). I next positioned the mounting block over the cabane strut with the top of the block on the alignment mark (not seen in the picture, but the mounting blocks have a rabbet groove that the aluminum strut fits tightly into. 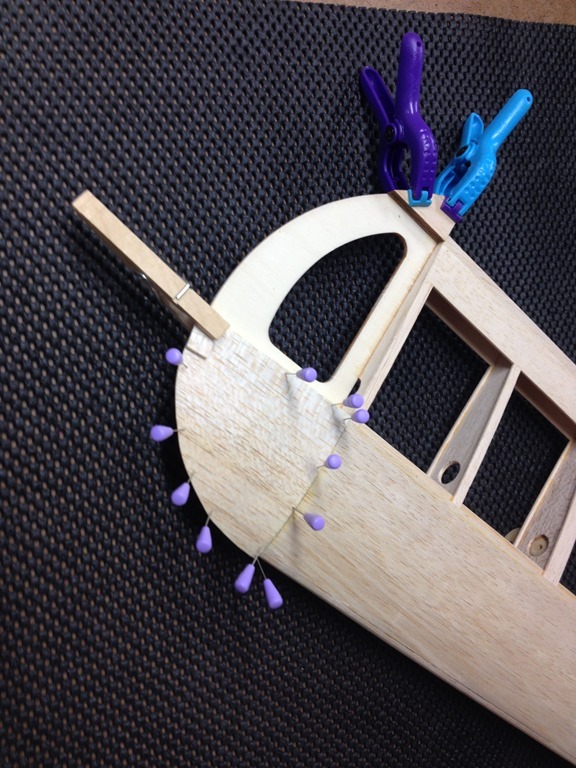 This ensure that that the block is in the proper position and that the hole in the cabane strut will be aligned with the hole in the fuselage. Finally, I position the laser cut “C” shaped plywood positioning plate around the block (basically in the reverse order that the instructions call for). With everything lined up snugly, I tack the plate in place with a few drops of CA, then remove the block, the cabane strut, and the alignment dowel. 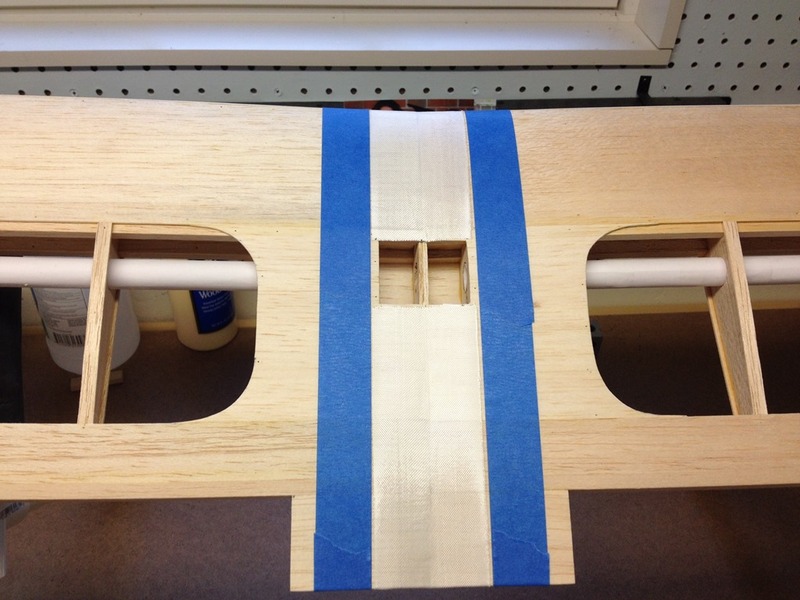 I use CA to secure the mounting plate and a little Titebond to glue down the mounting blocks (being careful to keep the groove clear of glue). This is then repeated for the other three mounting blocks. 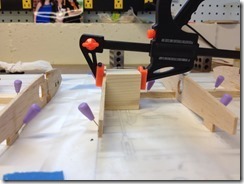 The instructions call for then drilling a 9/64″ hole through the fuselage and into the mounting blocks. This allows you to install a 4-40 blind nut in the back of the mounting block, but a 9/64″ hole is way to sloppy for a 4-40 bolt. 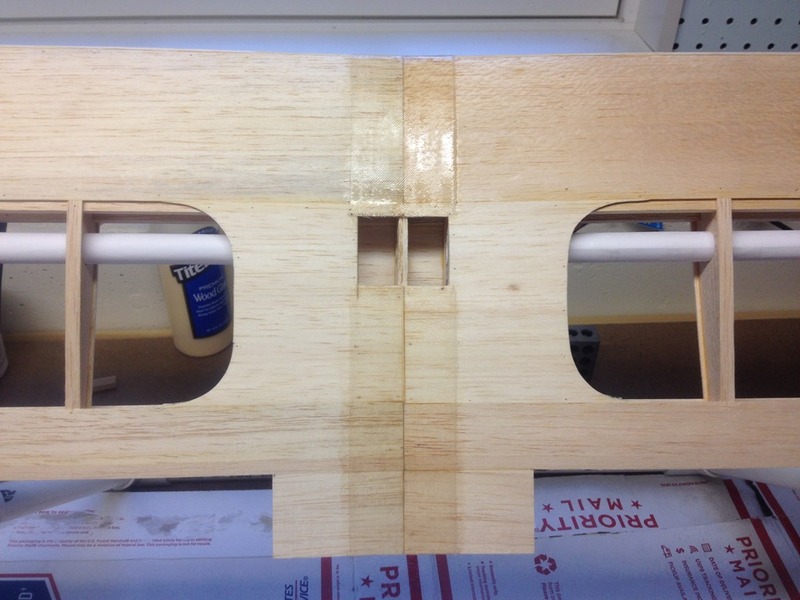 I start by drilling a 1/8″ dia hole from the outside through the mounting block, using the existing hole in the fuselage for alignment. I then drill a 9/64″ dia hole through the back side of the mounting block (not going through to the fuselage side) to accept the blind nut. Last step is installation of the blind nuts themselves. I did not want to take a chance at messing up my perfectly aligned assembly by hammering them in place, so I simply drew them in by tightening a screw and washer. Finally, I epoxied in the firewall and F3 former, using my 1-2-3 blocks to ensure everything was square. This was done in two steps, first gluing the firewall and F3 former to one side, letting the epoxy cure overnight, then flipping this assembly over and gluing to the other fuselage side. Next up is to assemble the rest of the formers into the fuselage. 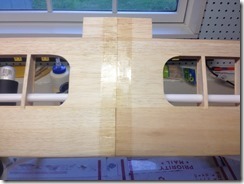 Since I plan to use a Sullivan tail wheel assembly, I will need to drill and install blind nuts in the fuselage bottom. This will be much easier to do before everything is assembled, so I guess it’s off to the LHS before I can continue. I have been picking away at the wing construction on the Hog Bipe on and off. Sheeting the wing tips went smoothly and I am happy with the end result. 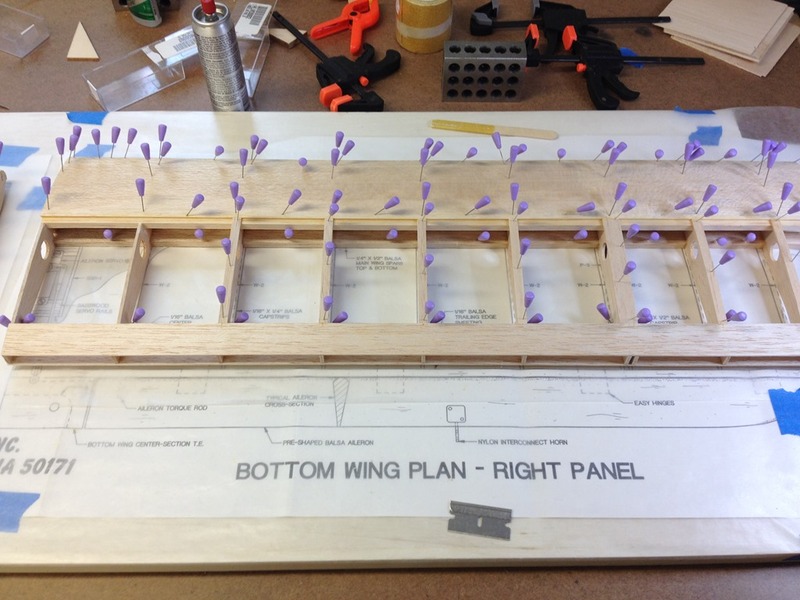 The lower wing is built in two pieces and glued together to obtain the proper dihedral. One little trick I used was to cut a block of scrap wood with the dihedral angle for the inner wing rib. 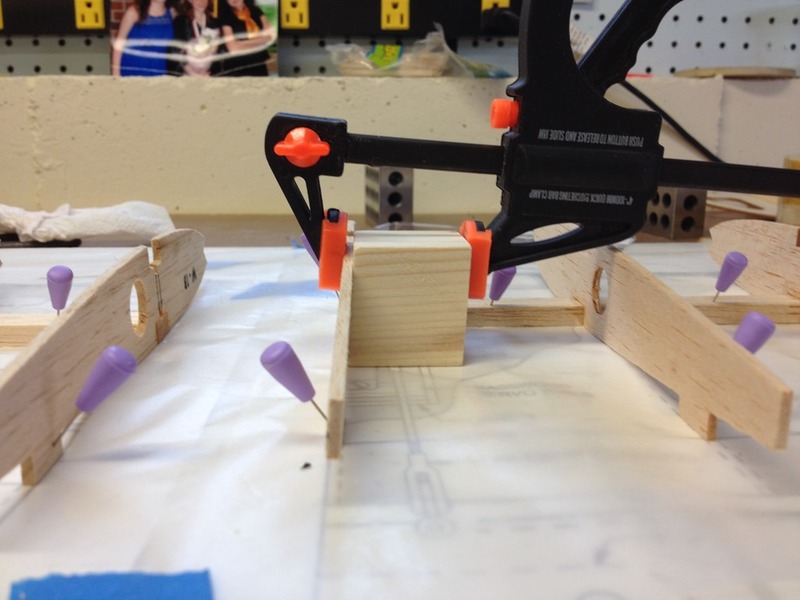 This allowed me to position and clamp the rib in place before gluing to the spar. 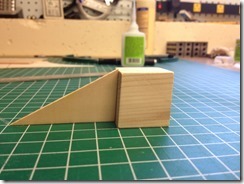 The first photo below shows the block against the kit supplied dihedral angle gage. The second photo shows it in use. The rest of the lower wing construction was uneventful and came out straight and true with the right dihedral. I bought my kit off e-bay, so I am not really sure when it was made, but I was fortunate enough to have one that included the parts for the optional dual aileron servo setup in place of the single servo in the original kit. The dual servo setup is much stiffer and is less likely to have flutter problems. My only deviation from a stock build so far has been to add a couple of paper tubes for the aileron wires and to use 2 inch wide fiberglass tape t reinforce the lower wing joint instead of the 1 tape supplied with the kit. The plans call for using medium or thick CA to saturate the tape weave. I chose to use epoxy instead. This was my first experience using fiberglass cloth and epoxy, and I considered it a small scale trial run for glassing a balsa plane. I sprayed a light coat of 3M-77 adhesive on the glass and laid it down between two strips of masking tape. I chose BSI Finish Cure epoxy. This is similar to laminating resin and was available at the my LHS. To ensure that the epoxy would flow smoothly and to get a good cure, I pre-heated the bottles for 10 seconds in the microwave before mixing. I applied the epoxy with and acid brush and spread it smooth with an old gift card. I rough sanded with 80 grit and applied a second coat after an overnight cure, sanding out with 80 and 150 grit after full cure. Overall, I am happy with the result. Structurally, I am sure this will be plenty strong. Cosmetically, I am satisfied for this application. It sanded out quite smooth, and would be a good surface for painting (if I was going that direction). I did end up with a few dry spots where the epoxy did not wet through the fiberglass fully, but I know what to look for now and should be able to avoid that in the future. 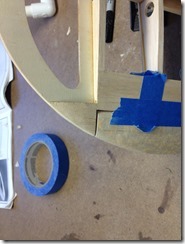 The last major step was to shape the ailerons to the tip. This also went smoothly with no real surprises or major problems. One minor problem was that one of the supplied aileron blanks did not have a well shaped rounded leading edge – a few minutes with a long sanding bar took care of that. Next up is to start in on the fuselage, but I will need to order my motor so that I can properly drill the firewall first. Made some progress over the weekend on the Hog Bipe. The top wing is close to being completed. So far, building everything stock and according to plans. No major issues so far and only one minor issue. 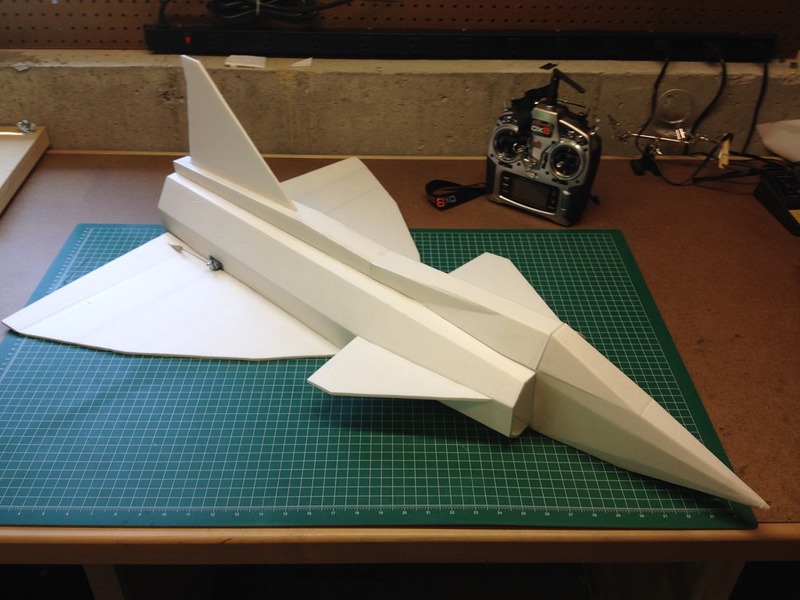 The kit only comes with a single piece of 1/6″ x 3″ x 48′ sheeting to be used to sheet the front portion of the top wing. The piece was badly bowed such that I needed to trim it down to just a bit over 2-3/4″ to get a straight and true edges front and back. Fortunately, this was just enough to give me a good glue joint to the top spar. The top sheeting was also a bit tricky to glue down properly. I started at the left edge and glued the front of the sheeting to the leading edger, one bay at a time, using medium CA and kicker. Once the front of the sheeting was attached, I wet it down with Windex to soften and help it to curve, and then using a toothpick spread TightBond wood glue on top of the ribs and along the spar. 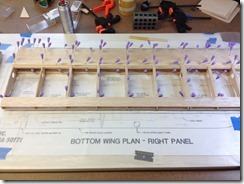 I like using wood glue rather than CA for attaching the sheeting to the ribs, especially considering the number of ribs involved in this long wing panel, as it has a longer work time and allows you to fuss and adjust a bit. I then start at one end and press the sheeting down into the glue on the rib and on then the spar, pinning it as I go. I work one bay at a time and am careful not to let the sheeting buckle as I go. 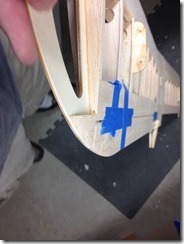 After removing the wing from the building board, I added a fillet of wood glue between the ribs, the spar, the leading edger and the sheeting on the inside. After letting the glue dry thoroughly, I pulled the wing off the board and after adding the maple mounting blocks, added the bottom sheeting. I used a slightly different technique this time. Here, I preformed the curved shape by wetting with Windex and gently bending the sheeting around the rounded corner of my workbench. It is not critical that the shape of the sheeting be perfect, just reasonably close. I then applied wood glue to all ribs, the inside of the leading edge and spar and then dropped the preformed sheeting onto the glue. I then pinned the sheeting to the leading edge, and worked the sheeting back by pressing to the rib and spar just like top sheeting. On one side, I worked the leading edge to spar one bay at a time. Although this worked well, I ended up with a slight gap (about 1/32″) between the front of the sheeting and the leading edge on the last two bays on the outboard edge. I ended up filling it in with a bit scrap. 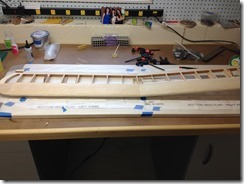 On the other side, I pinned the sheeting to the leading edge first, then went back to pin down to the ribs and spar. This worked much better. My SSE project is just about done. All I have left to do is final assembly of the main landing gear and final installation of the electronics (receiver, EEC, BEC). I also need to order a set of batteries so I can do a final balance. I polished up the main gear bracket and clear coated it yesterday. I was unhappy with the look of the clear coat though, as the polished aluminum seemed to lose much of its luster under it. The only reason for the clear coat was to protect the shine, so I stripped it off with a bit of acetone and buffed the aluminum back out again. This time, I put on a simple coat of carnauba wax to protect the aluminum finish. I also painted the wheel pants white. I was happy with how they came out, until I came back to check on them and found a hair settled into the paint on one. I will see how it looks after the paint fully dries, but I am likely to do a little light sanding and add one more coat of paint to both before final assembly. I have not been out flying yet this season and I want to get some stick time on some of my old standby birds before trying a maiden on the SSE, so for now, I will move onto my next build. With my SSE project nearing completion, I cleared off some bench space and kicked off my next build, a Sig Hog Bipe. I will build it as a “fantasy scale” early Army Air Corps plane with the blue fuselage and yellow wings color scheme. I am also thinking about some sort of custom cowl instead of the traditional Sig style open nose. Of course I am planning an electric conversion. Sig calls for 6.5 – 7.5 lb all up weight and a 0.60 sized glow motor. For electric motor sizing, I’ll round up to an even 8 lbs and plan on 150 watts per lb, which will put me right at 1200 watts. I want to keep with 6S batteries (22.2v), which will then need to draw about 54 amps. I like to have the motor on had when I start the build, so I can use the motor mount as a template to drill mounting holes in the firewall before assembling the firewall into the fuselage. I am leaning towards a Cobra C-4130-12 motor. Their site includes a prop chart which lists about 1120 watts with a 13×6.5 prop and just a tick under 1200 watts with a 13×8. The 13×8 prop (drawing 54 amps), is just a bit over the 52 amp continuous limit for this motor, so as long as I am not flying max throttle all the time, I should be in a safe zone. Battery capacity may be an issue though. I am hoping to use the same batteries here as my SSE. For the SSE, I want to keep to 4000 mAh maximum in order to keep to a reasonable weight. But 4000 mAh may not give me enough flying time for a heavier plane drawing higher current. As always, there are trade-offs with electric set ups, and I need to digest on this a bit before I make my final selection. Since I have not finalized motor selection, I will get started on the wing panels now. Given my slow build rate, by the time I am done there, I will have settled on a motor and have it in hand. I will be back traveling again this week, so I won’t even be able to start until the week after, though. I made some good progress on the SSE. The last bit of covering has been finished, and the blue trim has been added. I am real happy with the color scheme, but the covering job itself I only give a barely passing grade to. Several dust specks are trapped under the covering, some minor wrinkles here and there, some scratches and rash, some dents in the balsa, and lots of places where (despite my best efforts) more wood grain is showing than I had hoped for. Oh well, I continue to learn and I am confident my next covering job will be better! I finished off the cockpit with some black electrical tape for combing. I opted to forgo adding a pilot, mainly because I did not have one handy. The canopy was trimmed and installed. It’s not perfect, it was a little scratched to begin with, and I glued it on slightly off center. I intentionally left the back of the canopy a little long so I could trim to a clean fit. I trimmed close with a cutoff wheel on my Dremel and hand sanded the rest. While I got a nice clean fit, some of the sanding dust sneaked its way under the canopy, so short of cutting the whole thing apart, there is no way to get it out! The motor has been installed. All servos have been installed, all control surfaces are hinged and installed, and the control horns installed. The kit supplied control horns install with #2 pan head screws. The sharp points of the screws stick up past the control horn backing plate, so I carefully ground them down with the Dremel. The stab braces, which I assembled and polished some time back, were painted with clear and installed. 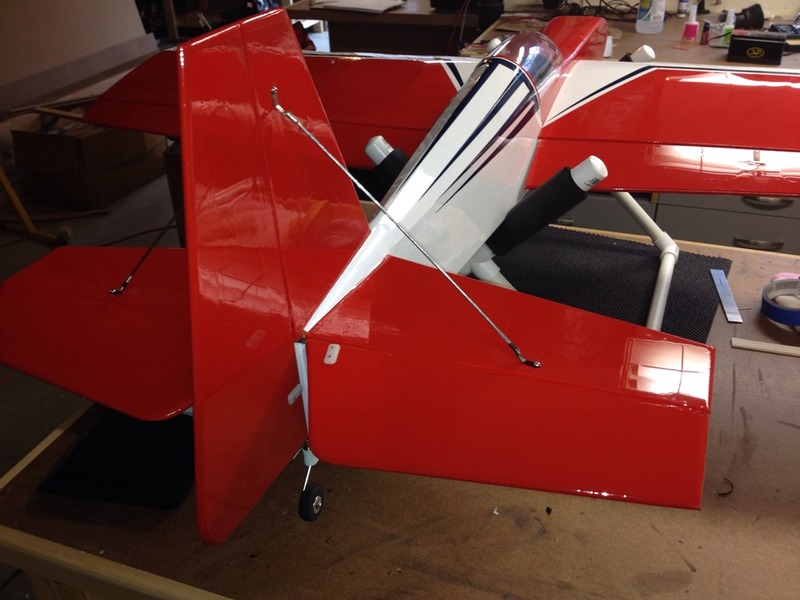 I am replacing the kit provided tail wheel assembly with a Sullivan Products one as it’s a bit more rugged. I installed the required t-nuts to attach the mounting bracket during fuselage construction, but I need to file a small notch in the bracket to clear the stab braces. Instead of a wheel collet, I decided to try silver soldering a pair of #2 washers to retain the tail wheel to the axle (the kit instructions recommend this as an option). This was the first time I tried this, but it turned out to be quite easy (no pictures of the intermediate steps though). Back at the start of this adventure, I really agonized over the motor selection. After going back and forth on RCGroups (http://www.rcgroups.com/forums/showthread.php?t=1988642), I ended up going with a 6S configuration and motor that will let me pull about 900 watts with an 11×7 prop, or around 1000 watts with a 12×6. Overall, this might be a bit more than I need, but how often do you hear complaints about having too much power? The down side, though, is that I am coming in a bit heavy. Without the battery, I am pushing 4 lbs. A 6S battery will likely add another 20 oz or so, so all up flying weight is likely to be around 5.25+ lbs. About 1/2 a pound over Sig’s target weight. I’ll have at least 160 watts per pound (good), and a wing loading of 19.7 oz/sq. ft. and a wing cube loading of 9.5. On the high side of acceptable for a sport plane, and I don’t plan to fly3D, so I am guessing I will be OK. I haven’t bought my batteries yet, but mockups with some weights are showing me a bit nose heavy – which would be a first for me! I am fairly certain that I will be able to get the balance right by adjusting the battery pack location, but worse case, I’m sure that any weight I might need to add to the tail would be trivial. Not too much new progress. I got the right wing panel and the right aileron covered. One more aileron to go and I will be done with covering. Why leave just one aileron? Well, I found myself rushing with the right one, and predictably I am less than satisfies with the results. I have just enough red covering material for the remaining aileron, so I can’t recover the right one (and I have nothing left for mistakes on the left one), so I decided to call it quits for today. I haven’t had much build time lately, but was able to get back into the workshop this weekend. I am close to being done with covering the SSE. I have to say that covering continues to be my least favorite part of building. I covered the rear half of the fuselage bottom and sides with white Monokote and all went well, but the turtle deck turned out to be a bit of a problem. It took me three tries to get it right, and in the process of ripping off the covering on the first two tries, I ended up denting and dinging up the balsa at the top of the fuselage sides. It’s hard to see in the picture, but unfortunately is quite noticeable in person. I’ll add some blue accent trim later, hopeful that will hide the dents some. What looks like wrinkles in the picture below are actually reflections. The rest of the fuselage and empennage covering went fairly smoothly. Despite my best efforts to vacuum and clean every surface (including the use of a tack cloth), I did end up getting a few dust specks under the covering. Ugh!! I got one wing done before deciding to call it quits for the day. So I’m down to one wing and the ailerons left to go. Got a few hours of building time this weekend and I started covering the SSE. I really dread covering, so I tend to put it off and find other things to do. I am at the point on the SSE where I ran out of other things, so covering begins. This will be my third covering job and my first time working with Monokte as opposed to AeroLITE (Stevens Aero branded version of Solite) which I used on Stella and my SA RV-4. I had two rolls of Monokote (one white and one red) lying around that I was intending to use on my SIG LT-40 (I lost interest in that project once I got past the trainer stage of flying and never did get the plane covered). I’ve read all the flame wars of Ultacote vs. Monokote and bought the Monokote on the advice of a friend who was helping to get started in RC. So far, I am finding Monokote to actually be a bit easier to work with than AeroLITE. Mainly, this is because it is a bit thicker making it easier to handle and less prone to burn-through when shrinking. It also does not fold over and stick to itself the way AeroLITE does. It clearly is a lot heavier than AeroLITE and would not be appropriate on a small park flyer. I have not tired any compound curves yet, which most seem to claim is Monokote’s biggest weakness (at leas as claimed by the Ultracote crowd!). 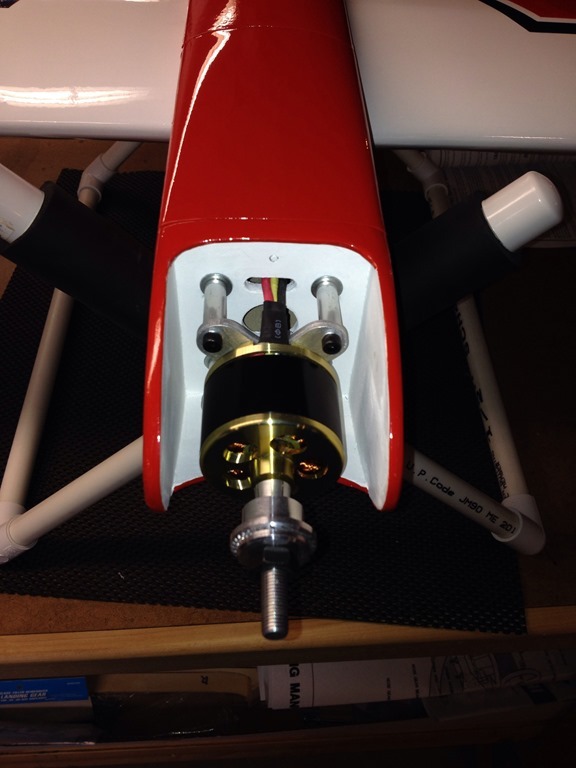 So far, I have the rudder and elevator covered in red and the rear half of the fuse bottom in white. I’m giving my covering job a passing grade so far, but barely. Most of my problems are related to surface prep. I spent way too much time sanding and filling (see my Lessons Learned post), but as you can see, it really did not pay off. Simply put, I need to develop a lighter touch when working with balsa during the construction phase. This includes not only a lighter touch when sanding, but also more care in handling the pieces prior to covering. I tend to be a bit too critical of my own work, but I also look at every project for learning opportunities and for things I can do better next time!